It is a story that Sam Kadri has told countless times before, but he is telling it again because 23 years later he still cannot believe it. The night that his wife went into labour with their second child, Kadri was stuck at work and got a call from his brother asking him to get to the hospital immediately. So he got into his car and drove as fast as he could. And as he did, Tom Cochrane's Big League, a song about a father who hopes his son will some day play in the National Hockey League, played on the car radio. "Honest to God, that's the truth," he said. "I knew right then it was going to happen. Like it was a sign". That paternal optimism is not exactly unique. Nearly every Canadian — whether they are from the beaches of British Columbia or the fishing villages of Prince Edward Island — dreams that his son is going to play in the NHL. What makes this one special is that Sam Kadri was born in Lebanon and his son, the Toronto Maple Leafs forward Nazem Kadri, is a practising Muslim. "It's typically an Anglo-Saxon game," says Sam Kadri, whose parents immigrated to London, Ontario, about an hour's drive west of Toronto, when he was four years old. "That stigma of being Muslim is always going to be with him". That perceived "stigma" might be changing. And it might be because of Nazem Kadri. The 23-year-old Lebanese-Canadian is not just the best Muslim hockey player. He is also one of the best hockey players. "It's one of the things I take pride in," Nazem Kadri says of being Muslim. "I know there's not a lot of guys with the same background as me. It's already become such a diverse sport, I just think years down the road with more guys being shown in the media there's going to be even more guys with different backgrounds. "I take pride in being a role model and attaining a certain reputation that everyone can base their lives on. I'm sure there's a lot of little kids out there who are pretty happy to watch me play. I think it just gives them a little boost of confidence, because it doesn't matter where they come from or how they were raised. If you're good enough, you're good enough". From a young age, he was always good enough. Too good, jokes his father, who steered his son towards hockey by building an ice rink in their backyard and letting his son practice his slap shot indoors on their hardwood floors. For Sam Kadri, the sacrifice was worth it. Hockey was the ultimate Canadian passport to acceptance. When he arrived to Canada, in 1968, hockey was all his friends at school talked about. So, naturally, he became a fan, playing street hockey with a tennis ball and watching his beloved Montreal Canadiens on television. He never played organized ice hockey because, as one of seven children, his parents could not afford the high costs of the sport. It was one of his regrets. "I was always envious of my friends," Sam Kadri says. "I said in my head that when I get a son, I'd make sure he plays". Nazem, who was practically born with a stick in his hands and was skating at the age of two, was a natural. He won a junior hockey championship when he was 17 and represented Canada at international events. On the night in 2009 when Toronto selected him seventh, overall, he became the first Muslim drafted into the NHL, His parents and four sisters, as well as about 40 others of his extended family showed up for the event, with his grandmother wearing the traditional hijab. Fans booed when his name was called by the Leafs, but it was about hockey — not race or religion. The draft was held in Montreal, whose Canadiens are the Leafs' greatest rival. Still, Kadri says he has dealt with some ignorance from opposing players and fans throughout his career. His answer is always the same: he does something on the ice to prove he belongs. "Normally I'm pretty good with getting them back," he says with a laugh". 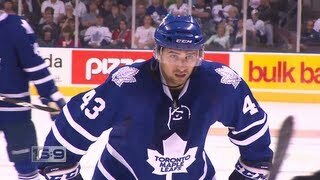 Kadri's coach calls him a "magician with the puck". A teammate says the 23-year-old, who is the youngest on the team, "has only scratched the surface on how good he can be". That is good news for the Leafs and the championship-starved city of Toronto, which last won a Stanley Cup in 1967. But it is also good news for the Muslim community. Kadri, who organizes an annual golf tournament for Islamic Relief Canada, wants to be a symbol of change. His says his name, translated from Arabic, means "leader". When he was drafted, he told reporters: "A lot of Muslim kids are going to start playing hockey because they see someone like them be successful in that area". The better Kadri gets, the brighter the spotlight will shine on him in the predominantly North American and European sport. He understands it is part of his role to bring attention to his culture, but he hopes fans eventually will judge him and other players on their skill rather than religion or ethnicity. Already he is noticing a difference. He gets letters almost every day from kids who say they started playing because of him. The last time Kadri saw a minor hockey game, it was not just a bunch of white kids on the ice. The landscape had changed. "You didn't see too many of my culture playing when I first started," he said. "It was all just Canadian or white. Now when I see my little cousin playing, you see so much more diverse backgrounds. It's going to turn into a baseball thing, where everyone is from somewhere else. To see that you can make a difference, it's great". And he is doing it without sacrificing any of his beliefs. Kadri said he tries to observe religious holidays, although it is a challenge to fast or pray five times a day during the season. "That's probably the hardest part, especially with Ramadan; it changes every year so it's not always at the same time," he said. "When you're playing and you have to fast at the same time, it's challenging. What do you thin about this?